A cultural cornerstone of Elgin and the Fox Valley, the Elgin Master Chorale creates a thrilling, emotional experience for audiences at each performance. Celebrate great choral music performed with passionate excellence. See for yourself why audiences are saying, “It’s my choir.” Make it yours, too. 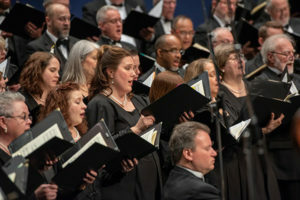 Handel’s triumphant masterpiece “Dixit Dominus” brings the 2018-19 season to a close. This performance will feature the Bella Voce Sinfonia, an ensemble which specializes in bringing the most historically accurate Baroque performances possible to the stage. Experience a concert with vocally acrobatic singing and join us in this celebration of true virtuosic musicality. Saturday, Dec 8, 2:30 & 7:30 p.m.
Sunday, Dec 9, 2:30 p.m.